I n prior posts I have waxed on and so on and so forth about my latest camera, the Sony RX-100. Every now and again I actually take photographs with it, which I hope allays the boredom for non-technically minded readers of this site. Recent test results have shown the little beauty performs better than some much bigger cameras….I’ll endeavour to show here why that is important and why it helps take better shots. 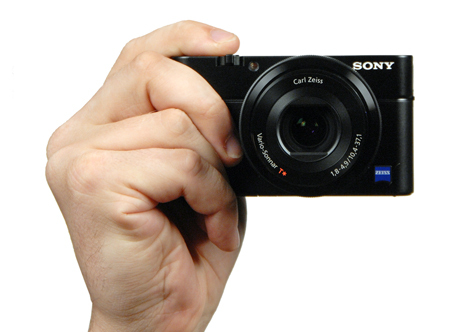 With the exception of the Canon Powershot G1 X, whose format is not comparable to that of the Sony RX100, the Cyber-shot is the expert compact with the largest sensor. But Sony’s 1″ CMOS sensor distinguishes itself not only by its large size and by providing the best sensitivity among the expert compact cameras (G1 X excepted), it also achieves record-breaking color depth and dynamic range in its category. The Cyber-shot RX100 doesn’t just crush its direct competitors in the expert compact market, it also encroaches on the territory of certain compact hybrids such as the Nikon 1 J1, J2, and V1, all more bulky and an entire generation behind this new sensor designed by Sony engineers (who are obviously the most inspired in the entire industry). OK, so what do these data mean – who cares? Well Dynamic Range is very important to me. When trekking, or when anywhere lit by bright sunlight, at any time of day except early morning or evening, the difference in intensity between the bright parts of a scene (highlights) and the dark parts (shadows) is usually too great for almost all compact cameras to record. As a result, the highlights get blown out – i.e there is minimal detail visible or recoverable in the brightly lit areas. The human eye has a far greater dynamic range so what you see on the day looks fine, but cameras are much less sensitive, so what you get from the camera when you get home is a lot less impressive. There are two solutions to this problem – firstly shoot only at around sunrise or sunset when the light is lovely but less intense, or secondly, take a big DSLR camera with a big sensor that has greater dynamic range. Neither are really practical on a trek – you can’t choose the time that wonderful scenes appear in front of you, and big cameras are too heavy, impractical and vulnerable. Incredibly, the DR values of the RX-100 are not only better (according to DxO) than the two models above but also better than the semi-pro and full-frame Nikon D700 (although all are blown away by the most recent D800E). Colour depth relates to the ability of the sensor to resolve different colours – that is to what degree of subtlety color nuances can be distinguished from one another. 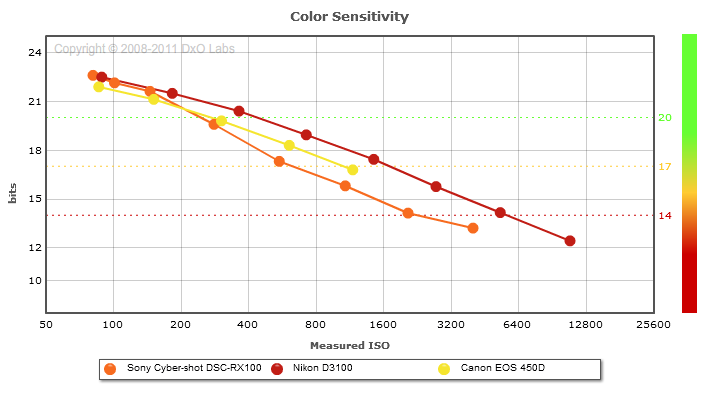 So the colour sensitivity reports, in bits, the number of colors that the sensor is able to distinguish. The maximum sensitivity is 24 bits (that’s 8 bits from each of the three colour masks in a pixel, 3×8=24), which allows in theory around 16.7 million colours to be resolved, and the Sony and most DSLRs can resolve close to the maximum. That’s in marked contrast to even the Canon S100, and way better than almost all other small compacts. Today’s PC screens and Apple iPads can show the full 24bit range, while most other tablets can show only 16 bits (it pains me to say this, but this is a good reason to get an new retina display iPad). As a result, the ability to resolve different colours is quire important – they can all be seen on a PC or ipad display if you can resolve them on your camera. Of course the software used to generate the image has as much influence as the sensitivity, but high colour depth is a very good starting point. So overall – these results show what an amazing camera the RX-100 actually is. Of course one shouldn’t run away with the idea that it is really better than a DSLR – the lack of a long zoom, and the limitations of the small design mean that DSLRs can do some things better. 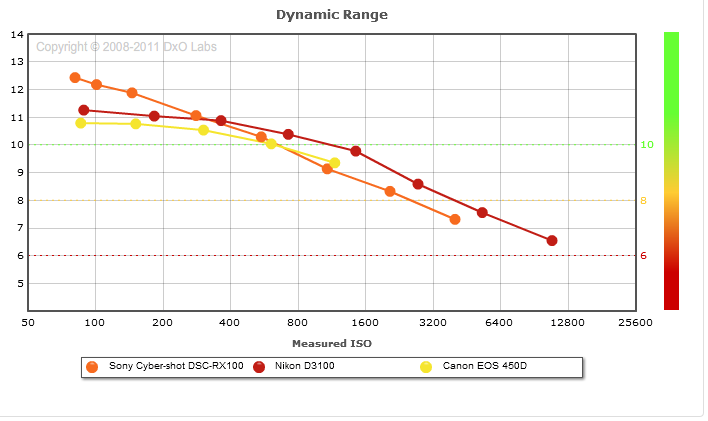 But for me, the small size, and fabulous sensor mean that I will hardly ever use my D7000 again. Did I need the data to tell me that the little Sony is a great camera? I guess not, but now I know one key thing – any bad photos I take are going to be down to my technique alone, and not the technology. That’s actually quite liberating. Until the next great thing comes along.